Dead of Summer: Ronen Rubinstein on Camp Stillwater's Death Toll and More! 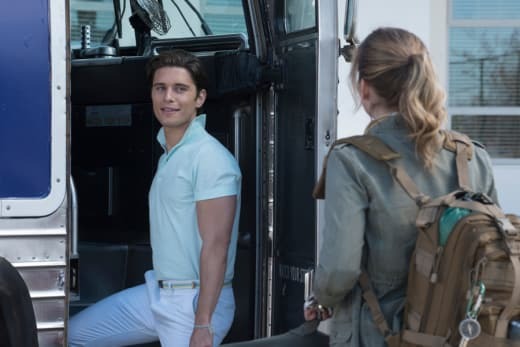 We recently had the opportunity to speak with Ronen Rubinstein, who plays Alex Powell on Freeform's Dead of Summer, and he was very tight-lipped about what death will bring to Camp Stillwater over the summer. While things are only just getting started for the teens at Camp Stillwater, the show has started off at a breakneck speed, and only in Dead of Summer Season 1 Episode 3, we were left wondering if two of the main characters could possibly be dead, already. Find out what the summer will bring to the campers, as well as some insight on Rubinstein and his plans for after Dead of Summer wraps! TV Fanatic: What drew you to the character of Alex Powell? And did you know about his past when you signed on for the pilot? Ronen Rubinstein: When I was testing for the role in Los Angeles, they were very brief. They told me that Alex was Russian, that he had a Soviet past, and that it was going to be revealed in Episode 2. And I thought that was a very weird coincidence, because I’m actually Russian myself. Did you speak Russian before or did you learn that for the role? It was actually my first language. The scene where Blotter sees Alex with the hand coming out of his mouth, what was it like to film that? It definitely took us a few days to film it. It was either me looking at him and giggling at what he was doing, or him trying not to giggle while watching all the stuff that I was doing. After we got the giggles out of the way, we got back down to business and just made what you saw on screen. During the rest of the season, will Alex suffer any guilt over what he did to Blotter? Is that what he’s going to continue to do for the rest of the season so that he could come out on top? Yes. I don’t want to reveal too much, but he’s definitely going to keep that attitude. When certain things happen, some things might change, and it will vary, but for the most part it will continue. Is there any death coming to Camp Stillwater? It looked like Amy might not make it when the lighting struck her at the end of episode three. There’s definitely going to be some death. I can’t reveal the who or what but it’s going to be a big surprise to everybody. They are all done extremely well, thought out and dramatically, and aesthetic-wise very beautifully, so it’s going to be a very nice surprise for people. Do you know how the season is going to end yet? No, not yet. We actually just received episode nine, so we don’t know what will happen in the finale. Who is the biggest jokester on set, and what is the atmosphere like? I think all of us have a time for jokes and then we get serious, we get down to business. There is a lot of long hours, and a lot of the time you are in the middle of nowhere, but the entire cast has been extremely close since the beginning of it all. So just having that kind of family bond on set makes the environment very light and very fun. But when it’s time to work, we all get back down and focus and do what we have to do. Is there anyone from the cast that you would like to have more individual scenes with? I’ve been pretty lucky with having individual scenes with each character so far. What are your hopes for Alex in Season 2? My first hope is that there will even be a Season 2. And then whatever the writers will throw my way I’m sure will be awesome because they are extremely talented. You were on Orange Is The New Black, how was the atmosphere on that set compared to your current one? Over there I was a guest star and here I’m a series regular, so I’ve obviously spent much more time on this set. On OITNB, I was on set for four or five days and I was with Taryn (Manning) most of the time. I can tell you how it was with her, I don’t know the rest of the cast enough, but she’s a pro. She’s been doing it for so long. Taryn took the time to welcome me as if I was on the show every single season. And then you get the work done, work through everything, talk, and you get to know each other, so she made me feel extremely comfortable. Some of our scenes were pretty revealing and sensitive, so I felt like being at home. The work just translated to what you saw on screen. Would you like to go back, if given the opportunity? Absolutely, if the opportunity comes. That show is one of the biggest shows in television history, it’s one of the greatest topics in television history with how they’ve been able to involve so many women in every department, and I’m not just talking about actresses. So if the opportunity came along, it would be a complete honor to continue. What are your plans after Dead Of Summer wraps? Definitely get back to New York to see my family and friends, that’s the number one thing. And then just take some time to relax, if it’s possible. But if a good opportunity and a good job comes my way, then it’s right back to work. Do you have any other roles or any other projects that are coming out? No, I’m mostly just auditioning and you never know, something might strike and something might not. If something happens, something happens, that’s the reality of this business. If you could play any character, what character would it be? I would like to play pretty much anything that has great people and is a great overall project, but off the top of my head, it would be a complete honor and a dream to play Anthony Kiedis in a Red Hot Chili Peppers movie. I take it you’re a fan? I saw your video, that you posted on Instagram. Yes, I’ve been a fan for a long time. What has the experience of being on a Freeform show been like, including social media? They have some of the best PR teams out there, who really know how to market the show and take care of the cast and everyone involved. It’s been amazing. It’s definitely helped to get a small taste of the social media craze with OITNB, I think that prepared me well for this. Freeform has all the right people to walk you through everything, or if you have any questions or concerns, it’s all people at the top of their game. It’s been a very smooth road so far and the fans have been beyond anyone’s expectations. We’re getting fan mail and messages all the time, they continue to show their love and support, and it’s only been two episodes so big, big, big praise to the fans so far because they are the people that watch the show. If there was any show that you could be on, which one would you choose? Vikings. I’m 120% sure that I would like to be a part of Vikings on The History Channel. That show has got my full attention. Make sure you catch up with Rubinstein when you watch Dead of Summer on Freeform this summer, or watch Dead of Summer online right here on TV Fanatic.